Topics: New Art Titles, New Architecture Titles, New Design And Fashion Titles, New Photography Titles, Order Form, and Order A Copy. 23 users visit the site each day, each viewing 1.20 pages. 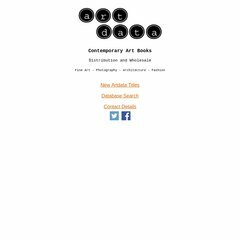 Artdata.co.uk's IP address is 212.159.9.90. ns2.force9.net, and ns1.force9.net are its DNS Nameservers. It is hosted by Virtual Isp Portal Servers (England, Sheffield,) using Apache web server. PING hp.force9.net (212.159.9.90) 56(84) bytes of data.